I spend a lot of my day repeating mantras in my head and sometimes aloud. "You can do this." "You are strong and capable." 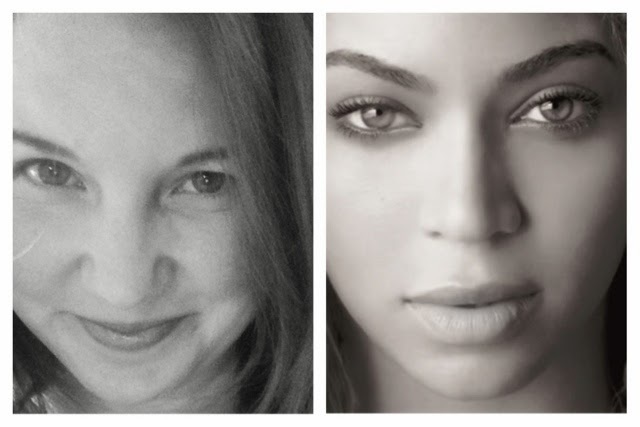 "Find your inner Beyonce." Along with many other Beyonce inspired quotes. To me, Queen Bey is this fierce, happy, and grown woman that laughs in the face of hard times. A photo taken when I thought one kid at the grocery store was difficult. 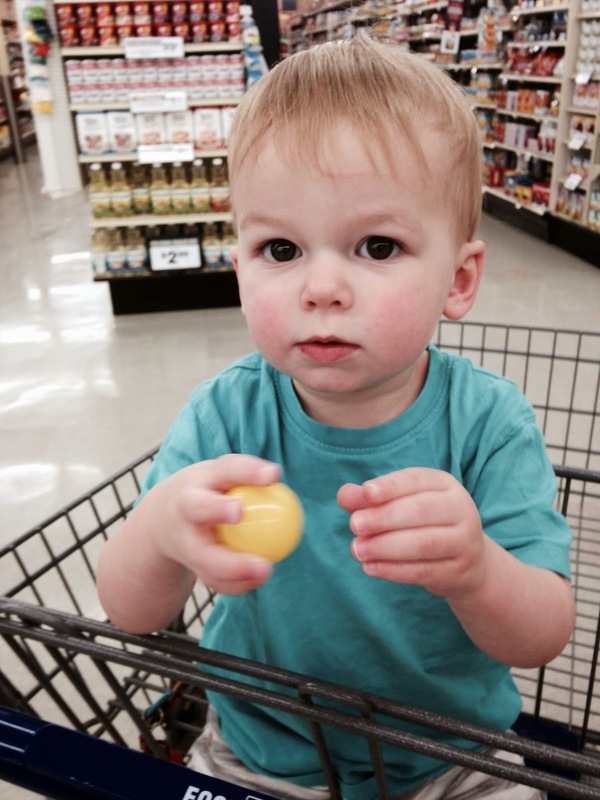 I have no photos of a grocery trip with two kids because busy. My mantras usually come out full force during trips to the grocery store and other various errands. I repeat these inspirational quotes over and over in my head while I bribe the toddler with character gummies to please for the love sit on his bottom. I pause occasionally to baby talk to a not listening not caring 3 month old who would just rather attract every person in the store by crying causing them to grace me with a never welcome side eye. I see you and I smile in your direction while calming my inner Beyonce. bow down, bow down, ya know? All the while trying to complete my poorly written grocery list without buying the 2 year old too many consolation impulse items. Full disclosure: last trip he scored a balloon and two boxes of character gummies. I did, however, manage to get outta there without the purchase of a large bouncy ball. No thanks to the evil store designer who placed a vat of them right there in the middle of the freezer section. You rotten ol' mother hater you. On occasion there will be a sweet lady with grown children who will stop to tell me her children are grown up now but she still remembers just how hard it is with small children then she pats my shoulder and says bless you. This is a nice breath of fresh air amongst the ten or so other people who stop to tell me not to blink because I'll miss it. This is usually told to me as my toddler is trying his best to lick the cart while my newborn cries decibels I wasn't sure existed. I get it, I do, but all I'm thinking in that moment is I wouldn't mind being able to blink and miss this grocery trip from hell. Well that and "you can do this" "you are strong and capable" "beyonce beyonce beyonce...". Once my mantras are repeated about one trillion times and my cart is full of everything on my list plus one or two toddler bribes, we make the trek outside and if I'm lucky it won't be raining cats and dogs. Lately, I have been not so lucky. Then there's the calamity of unpacking the children into the van and then the groceries and then assessing how far the cart corral is and making the quick decision to lock the van and properly replace the buggy or just leave it in a strategic manor and say a quick "let this cart not cause any car damage" prayer and be on my way. The ride home is always a treat of tired, hungry baby and a toddler who dropped something and would like it back 4 minutes ago. Once we are home, I hoist the baby's carseat and balance the toddler on my hip shuffling them inside quick with a distraction so I can get the cold stuff in the fridge before I answer their requests for food, diaper changes, and glorious mother loving naps. Once the babies are asleep, well that's usually when I remember that one important ingredient that is still at the store and this is precisely when my mantras no longer work. And I cry like a big not Beyonce. There should be a sitter service that offers to just ride around with you, sit in the car with your babies while you run in the store to buy toilet paper or go to the post office. That person will also check your grocery list twice, kinda like Santa, so you don't forget anything. And then they will help you unload the car and make sure no banana gets left behind (that's happened(ew.)) And after you put your children down for a nap, they tell you how pretty you are while you eat the dark chocolate that they convinced you that you deserved. *realizing now that this business idea is modeled after my husband. I wonder if Jay takes care of Bey the way my J takes care of me? Huh.